1In 2014, Belgium commemorated the fiftieth anniversary of the signature of the Belgo-Moroccan agreement of 17 February 1964, which allows many Moroccan workers to make a living in Belgium. Following the signature of this agreement, the number of Moroccans living in Brussels increased significantly: from 461 in 1961, to 39 294 in 1970 [Loriaux, 2004]. Fifty years later, in 2014, there were 191 292 Moroccans living in Brussels who had acquired Belgian nationality, or Belgians with Moroccan parents who had acquired Belgian nationality, which makes it the city with the highest concentration of this community in Belgium.1 Moroccan migration is marked by its extraordinary geographical scope – more than one hundred countries – and by its significance, as 10% of the Moroccan population lives abroad. However, the regularity of yearly visits (55% of Moroccans who live outside of Morocco returned for a short visit in 2013) is a sign of the attachment which Moroccan migrants feel towards their country of origin [Alaoui, 2013]. 2There is an important cultural diversity within this population, which is often wrongly considered to be a homogeneous entity. This article shall analyse a specific facet of this Moroccan diaspora culture in the capital of Europe, namely the Gnawa in Brussels.2 Here, we shall consider the Gnawa as part of a vast transnational Moroccan community, defined by Riva Kastoryano as “a community composed of individuals or groups established within the different national societies, based on interests and common references (territorial, religious and linguistic references) and on transnational networks to reinforce their solidarity beyond national borders” [Alaoui, 2013]. 3This research is based on data gathered in Brussels through participant observation, a method which allows an immersion in the context and permanent contact with the musicians. In this framework, the recording of seven performances between April and July 2014 constitutes the main part of our corpus under analysis. 4As a minority community in Morocco,3 the Gnawa claim to be the descendents of slaves from western Africa who developed a specific cultural practice towards the end of the 19th century [Becker, 2011]. Although the Gnawa are Muslim,4 their rituals – which combine animism, worship of saints and music – are not in keeping with those advocated by Islamic orthodoxy. Furthermore, due to their African roots, the Gnawa have been more marginalised than other brotherhoods whose practices are quite similar [El-Hamel, 2008; Sum, 2012]. 5The Gnawa perform in two contexts: rituals, during which a repertoire of sacred music is played in a religious framework, and public concerts, whose repertoire is both secular and sacred, in front of an audience which is not always aware of the rituals. Although certain studies tend to present rituals as being more important from a historical point of view [Hell 2002; Kapchan 2008], others underline the complementarity between the two practices since the beginning [Majdouli 2007; Becker 2011]. Created in 1998, the Festival Gnaoua et Musiques du Monde in Essaouira (Morocco) presents these two dimensions and attracts hundreds of thousands of visitors (figure 1). According to historian Cynthia Becker, this success is the result of a process of awareness raising and legitimisation among Moroccan and western populations, begun by the Gnawa at the end of the 19th century [Becker, 2011]. Among them, the maalem Rida and Abdelwahid Stitou, Mohamed-Saïd Aksari and other musicians active in Belgium. 6During the rituals – called lila (“night”) – sacrifices, trance, possession and practices of fakirs are carried out in private, to songs honouring God, the saints and the entities of the invisible world (the mluk). The guembri lute plays a central role during Gnawa performances and is known to attract the spirits, which are summoned and present during lila ceremonies. The mystical aura of these rituals has aroused much interest, and the Gnawa universe is often approached from this angle [Pâques, 1978, 1991; Lapassade, 1998; Chlyeh, 1999, 2000; Hell, 2002; Baldassare, 2005; Kapchan 2000, 2004, 2008, 2011]. 7Nevertheless, and although “the Gnawa place great emphasis on the essential function of music and dance” [Hell, 2002], the Gnawa musical reality has not been the subject of much analysis: apart from Timothy Fuson, whose works could not be consulted, and Maisie Sum [Sum, 2012], the studies are limited to a brief presentation of the instruments and main features of the repertoire [Baldassare, 1999; Aydoun, 1992 and 1999]. This gap constitutes one of the starting points of the present research, as well as the (relatively recent) growing interest on behalf of the academic community in the study of musical practices in a transnational and diaspora context. While Mark Slobin stated already in 1994 that “Intra-diasporic music making really could use more attention, even among ethnomusicologists. This might require both a close-up and a panoramic lens” , this field has only been studied recently in Europe. In his recent works, Jean Pouchelon has focused on the Gnawa populations who have lived a migratory experience in Paris and Montreal [Pouchelon, 2014 and 2015]. 8Despite its relatively small territory, Belgium ranks fourth in the world as a host country for the Moroccan diaspora5 [Alaoui, 2013]. Brussels stands out due to the significance of its Gnawa community (in the broad sense): although Gnawa communities exist in other European and North American cities (Paris, London, Montreal, Barcelona), the Gnawa community in Brussels is among the biggest. 9In this particular context, an analysis of Gnawa musical practices in Brussels seems pertinent. Who are the main stakeholders? How do they organise themselves? How do their performances generate meaning in Belgium? 11Although it pertains to oral tradition, the Gnawa musical repertoire is surprisingly codified and includes a specific number of songs and dances which are performed in a precise order. However, one performance always differs from another in its general structure or in more specific details, such as the musical motifs. As the Gnawa insist on the importance of respecting tradition, the meaning given to the performances may therefore be found in the freedom which the musicians grant themselves, thus influencing a more structured position [Sum, 2012]. In this perspective, the differences between practices in Morocco and in Belgium may be studied for their potential meaning. 8 Luc Mishalle, personal communication, 23 June 2014. The arrival in Brussels in 1998 of the maalem Rida Stitou, son of the maalem Abdelwahid “Stitou” Barrady from Tangier, marked a turning point in the history of the community. Very quickly, Rida gathered musicians – not necessarily from Gnawa families – and formed a group9 which plays on various occasions, for lila ceremonies as well as for weddings or neighbourhood festivities (figure 2). Two years later, the ASBL Arts et folklore gnawa was created on the initiative of Rida and Mohamed-Saïd Aksari,10 who wished to give legitimacy to their activities. They thus hoped to present a clear structure to the people who wish to know about them, as well as to event organisers who wish to hire them for a performance. In addition to concerts and lila ceremonies, they are involved in many activities, usually carried out voluntarily by the musicians: information sessions in schools on Gnawa culture, performances for elderly people and even training sessions for beginners. 11 Maalem Rida “Stitou” Barrady, personal communication, 23 April 2014. 12 Mohamed-Saïd Aksari, personal communication, 24 April 2014. Gnawa de Bruxelles therefore wish to develop their activities in Brussels, build bridges with the local authorities and adapt to the operational modes in effect in their host country, even if the procedures are slow and complex. 15Although Rida maintains very close ties with a Gnawa group from Tangier for which he continues to act as maalem throughout the year, Gnawa de Bruxelles are becoming established in the Belgian landscape. The group is currently composed of musicians of Gnawa origin and others who are specialised in another style of Moroccan music, and whose knowledge of the Gnawa repertoire allows them to participate in certain performances. 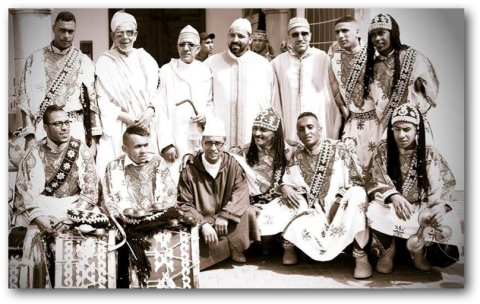 This integration of musicians also has the effect of widening the repertoire of the group: Gnawa de Bruxelles are also starting to play popular Moroccan music and the repertoire of other brotherhoods. 16The ASBL has notable visibility and recognition in Brussels, to the point where young people of Moroccan origin who have no connection with the Gnawa world, become involved as completely integrated members of the troupe. The case of Yassine is particularly telling in this respect: having grown up in Brussels in a family of Moroccan origin with no connection with the Gnawa, he spent time with Gnawa de Bruxelles in his neighbourhood since his childhood, and gradually started playing the qraqeb (large metal castanets specific to Gnawa music), and then learned singing, dancing and the drum. Today, he accompanies Rida in his concerts abroad, and this summer married the daughter of a famous Moroccan maalem, making his spiritual union with the Gnawa universe official. 17The musical characteristics of the repertoire played by Gnawa de Bruxelles also reflect this redefinition of the usual categories of the Gnawa universe. Thus, the maalem Rida from Tangier plays a style specific to this region, called shamali (“from the north”), while many of his musicians play the marsaoui style, which is present in the rest of the country. The difference between these two musical styles is noticeable in the way the guembri is played, which is more melodic in the north and percussive in the south,13 as well as in the other musical elements (drum, singing) and the dancing. The inevitable collaboration between musicians from these two traditions creates a style which incorporates shamali and marsaoui characteristics. 19In 2007, several Gnawa arrived from Morocco to settle in Belgium. In addition to Rida “Stitou”, two other maalem live in Brussels: they master all of the instruments, know the musical repertoire and are able to lead a lila properly by directing the contacts with the invisible world. 20Karim (alias) is the son of a maalem from Fes who initiated him into Gnawa practices. In Belgium, he chose to stay with Gnawa de Bruxelles and is now in charge of the weekly rehearsals. These rehearsals are the result of a desire for collaboration between amateur and Gnawa musicians, and mark a formalisation of learning outside the Gnawa universe. During rehearsals, the maalem Karim shows the way to beginners, and does not hesitate to repeat a movement many times until the “students” are able to do it themselves. The group of beginners is called Kerkeba (one of the transliterations of the name of Gnawa metal castanets). Alone or with an amateur brass band conducted by Luc Mishalle, they play a repertoire of jazzy compositions in which Gnawa rhythms are mixed with Gnawa pieces accompanied by brass instruments. In addition to this activity, Karim participates in all of the Gnawa de Bruxelles concerts and plays the guembri in the lila ceremonies. Despite his status as a maalem, Karim does not have his own troupe and has continued to work closely with Rida. His personal situation limits him to this role: he cannot accept work in his own name or travel outside the Belgian territory. 15 Hicham Bilali, personal communication, 9 November 2014. 21Hicham Bilali was initiated by the maalem Hamid, also in Fes, where he grew up in Karim’s circle. Following some European tours, he settled in Brussels, which he felt was home to the only professional Gnawa in Europe.15 After a few years of collaboration with Rida, he decided to leave Gnawa de Bruxelles and join Daqqa Al Manar, another group from Brussels which was founded in 2007 and which plays traditional Moroccan music. Since 2009, Hicham is in charge of everything related to Gnawa music, and has formed a group of Gnawa musicians. Although they are not an ASBL, Gnawa Al Manar are in demand, for performances of ceremonies and concerts as well as for lila ceremonies. Unlike Gnawa de Bruxelles, Gnawa Al Manar organise at least one lila per year in Brussels, during the month before Ramadan. 16 Rida Stitou, personal communication, 24 April 2014. 22The members of Gnawa de Bruxelles and Gnawa Al Manar know and think highly of each other, but the competition which exists between them makes their relations somewhat tricky. Thus, the maalem Rida claims without hesitation that “there is only one traditional Gnawa group in Brussels”.16 However, not only does Rida know of the existence of this other group, he spends time with them, and some of the musicians from Gnawa de Bruxelles mix occasionally with Gnawa Al Manar and vice versa. 23It is important to note that the Gnawa universe in Brussels was recently the setting of an event which calls into question traditional constructions much more fundamentally, and in particular the gender-based distribution of roles in rituals and performances. Imane Guemssy, a young woman from Casablanca who arrived in Brussels in 2013, joined Gnawa de Bruxelles. She is self-taught and did not receive any instruction in Morocco, where in Gnawa practices, women traditionally have only two roles: that of the moqaddema, therapist medium and/or medium responsible for the ritual and communication with the invisible entities which determine the success of the lila, and that of the person who goes into a trance, as stated by Hell . Women very rarely play Gnawa music. Very generally speaking, in Morocco, a female musician is considered negatively, especially if she plays a string instrument [Aydoun, 1992]. Although this negative view is slowly disappearing, there are few female Gnawa musicians. And they are usually only present for secular occasions: women never play in lila ceremonies [Sum, 2012]. 17 Hicham Bilali, personal communication, 26 February 2015. 18 Imane Guemssy, personal communications, April-July 2014. 25This approach is particularly interesting when it is considered with respect to the growing secularisation of Gnawa practices, which has been observed in particular by Kapchan. According to the latter, the loss of meaning and interest in the ritual role of the moqaddema, which is no longer needed during concerts, has forced Gnawa women into a state of inactivity [Kapchan, 2011]. Imane, whose objective is to become a musician and leader of the ritual, therefore aims to reclaim the mystical power and lead the musical performance. 26By promoting Moroccan music, dance, costumes and views of the world, the Gnawa integrate their exoticism into the artistic landscape of Brussels. They participate in the life of the capital, through activities intended for entertainment as well as activities aimed at discovery and learning about another culture. As we have seen, this attitude is based on a desire to share a culture as well as a desire to sell it and to sell oneself. Hence the attention to detail which the Gnawa have shown in their performances (costumes, perfumes, dances). They have also developed ideas with a very strong reference to tradition. This folklorisation process, which emerged in the 19th century among the Gnawa in Morocco [Becker, 2011], has been seen elsewhere, in particular among the Mursi in Ethiopia [Ferran, 2012]. 19 Mohamed-Saïd Aksari, personal communication, 24 April 2014. 27When the Gnawa who live in Brussels play with Belgian musicians, they confront them with other ways of learning. While in Belgium, music is often felt to require theoretical knowledge and a specialisation in an instrument, the Gnawa advocate learning through the practice of a repertoire considered as a whole, whereby everyone knows and masters not only the instruments, but also dancing and singing. The weekly lessons are not only intended for Belgians of non-Moroccan origin: they are also aimed at “teaching Moroccans about Moroccan culture”,19 i.e. teaching an immigrant population about part of their roots. In this perspective, the Gnawa see themselves as belonging to a transnational Moroccan community and are openly proud to act as a connection between Belgium and Morocco. 28Pouchelon  and Hell  have underlined the democratisation of Gnawa society following western interest in it. The consequences of this democratisation are clearly visible in Brussels. While their ideology advocates total coherence with traditional values, the reality is somewhat different. Imane’s project to become a maalema is not discouraged by the other musicians, even if the possibility of seeing a woman play the guembri on the Belgian scene raises concerns among the community. Due to her unique position, Imane risks becoming a disloyal competitor for obtaining contracts with event organisers. The organisation of rehearsals as a result of the collaboration between Gnawa de Bruxelles and Met-X, an association aimed at mixing amateur musical practice and the music of immigrants, introduced a new method of learning which is completely foreign to Gnawa customs, and is based on formal learning out of context (figure 3). Furthermore, Brussels is a city where many Moroccans live, but the lack of people of Gnawa origin means that many musicians in the group do not have a Gnawa background at all. The integration of people who are outside the tradition is preferred above an association between all of the Gnawa musicians in Brussels, thus illustrating the existence of competition between the groups despite a limited distribution network, unlike what is seen in Montreal [Pouchelon, 2012]. The main aspect of Gnawa identity as defined by the musicians in Brussels goes beyond parentage, and seems to be linked to the desire to keep Gnawa musical memory alive through practice and spiritual relationships. 20 Various personal communications with Hicham Bilali, August-September 2014. 29Finally, this reorganisation of Gnawa practices has led to a verbalisation of practices, initiated by the Gnawa themselves. Thus, Gnawa de Bruxelles hold activities regularly which are aimed at explaining their musical practices and rituals. Hicham is currently working on a project which would stage lila ceremonies intended for an uninformed public,20 with a dual objective: on the one hand, to gain the interest of people who may then hire the Gnawa group Al Manar, and on the other hand, create new spaces for musical practice in a context which currently does not leave much room for Gnawa ceremonies. 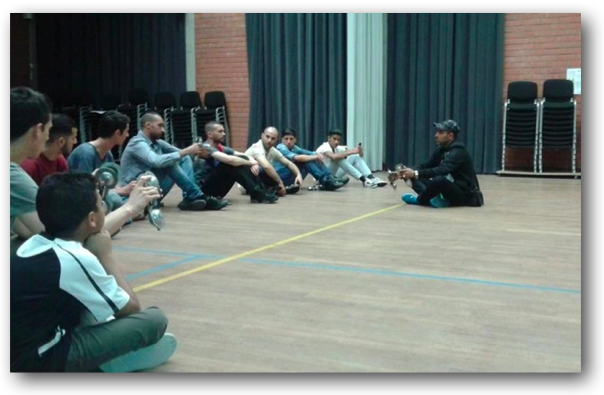 Through this project, Hicham hopes to revive the demand for lila ceremonies in Brussels (with or without a ritual purpose), and continues to act as maalem in this new performance framework. “In a diaspora situation, music […] unites the diaspora communities by creating musical contexts in which the country of origin is evoked in a semiotic fashion through sound” [Stokes, 1994, our translation]. “[the Gnawa traditions] have greatly influenced the other brotherhoods, which add – as the Aïssawa do for example – a Gnawa piece at the end of their singing and dancing ceremonies, with the colourful veils characteristic of their mystical journey” [Pâques, 1999]. 21 Concert given in the framework of the Midis-Minimes festival in Brussels on 9 July 2012. In Brussels, the opposite is also seen and innovations emerge. Thus, during a performance in 2012,21 the group Gnawa de Bruxelles used trumpets from the secular repertoire daqqa marrakchiyya, presenting it as a performance of Gnawa music. This mix seems to be unprecedented in Gnawa history. While it is true that fusion is now an aspect of Gnawa culture, in this particular situation the musicians claim to be Gnawa practising their tradition, and not creating a fusion. 32The specificity of the situation in Brussels leads the Gnawa musicians who live there to play frequently22 with other Moroccan musicians, which causes a change of status for the latter. 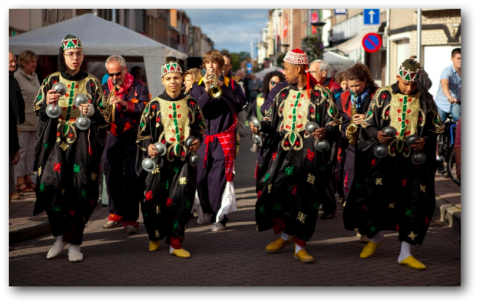 Gnawa culture had a status of “African” culture in Morocco, and now has the status of “Moroccan” culture in Belgium. Furthermore, during the Gnawa de Bruxelles or Al Manar public processions, many people of Moroccan origin stop to watch and dance, even though, in Morocco, the Gnawa brotherhood is still considered to be marginal by a large part of the population [Hell, 2002; El-Hamel, 2008]. While the notion of mix ‘entails the prior existence of "unmixed" styles’ [Stokes, 2012], Gnawa music in Brussels, although mixed, integrates new characteristics from other Moroccan cultures. This authenticity sought by the public thus corresponds more to the concept defined by Laurent Aubert: it is not in line with the rules which are supposed to be unchanging, but with the sincerity of the approach, the ability to adapt to a context and the capacity to meet a demand [Aubert, 2005]. 33In this community of Gnawa in Brussels, openness towards others is an indispensible condition for the survival of the culture. Far from the Gnawa nerve centre in Morocco, whose heritage serves as a source for new musical elements, they reinvest and reinvent ancestral practices to adapt to their environment and keep Gnawa culture alive, thus creating a specific Gnawa culture in Brussels, in the end respecting the spirit of a tradition based on fusion since its origins. 34Among the cities of the Moroccan diaspora, Brussels is home to the most Gnawa musicians. Organised in two distinct groups, these artists have integrated new elements into their practices, which could be explained by their relocation abroad. Furthermore, the comparison with the situation in other cities (in particular Paris and Montreal) allows us to assume that the situation in Brussels has a unique character. 35The methods of learning this musical practice, which have until now been non-verbalised, are now being formalised by one of the groups, in order to meet a demand from the outside. The presence of women – mixed with men not only in secular but also ritual musical practice – is an upheaval which seems to result from being far from the Gnawa nerve centre in Morocco. The perseverance of a young musician in her project to become a maalema may prove to be more fruitful in Belgium than in Morocco. Finally, the diversification of performance contexts due to the low demand for Gnawa traditional music in Brussels prompts Gnawa musicians to learn other Moroccan musical styles, which they use as inspiration for their Gnawa repertoire, in theory closed to the integration of outside elements. 36This multiplication of the types of performance, which demonstrates the capacity of the Gnawa to adapt to their host country, would be worth investigating next. Far from being activities on the side, these new types of performance seem to participate fully in the usual activities of Gnawa musicians, thus calling into question the very notion of Gnawa identity. Since they are no longer only men, no longer only born in Morocco, and no longer learn through exposure and imitation, how do the Gnawa in Brussels define themselves today? Their identity seems to be linked more to a will to keep the Gnawa memory alive, through musical practice as well as through spiritual relationships. 37Thus, far from deploring a hypothetical loss of authenticity due to their migration, the Gnawa in Brussels have redefined their musical practices and their methods of operation, by adapting them to their new place of residence. In so doing, they continually reshape their identity, which allows them to be part of a very specific cultural and social heritage while exploring new territories. ALAOUI, R., 2013. Peut-on parler de diaspora marocaine ? In: Hommes et migrations. Diasporas marocaines, 2013, No. 1303, pp. 7‑15. AUBERT, L. (dir. ), 2005. Musiques migrantes, de l’exil à la consécration. Geneva: Musée d’ethnographie. AYDOUN, A., 1992. Musiques du Maroc. Casablanca: Eddif. BALDASSARRE, A., 1999. Musique et danse des Gnawa. La lila/derdeba comme hypertexte. In: CHLYEH, A. (dir. ), L’Univers des Gnaoua. Casablanca: La Pensée sauvage, pp. 87‑103. BECKER, C., 2011. Hunter, Sufis, Soldiers, and Minstrels. The Diaspora Aesthetics of the Moroccan Gnawa. In: RES: Anthropology and Aesthetics, 2011, No. 59‑60, pp. 124‑145. CHLYEH, A. (dir. ), 2000. La Transe. Morocco: Éditions Marsam. FERRAN, H., Construction nationale et mouvements évangéliques. Deux facteurs de professionnalisation musicale en Éthiopie (de 1860 à nos jours). In: Cahiers d’ethnomusicologie, 2012, No. 25, pp. 75‑92. HELL, B., 2002. Le Tourbillon des génies : au Maroc avec les Gnawa. Paris: Flammarion. HELL, B., 2006. Ouvrir le poing: écoute, parcours initiatique et possession (Maroc, Mayotte). In: Cahiers de musiques traditionnelles, 2006, No. 19, pp. 161‑178. HELLY, D., 2006. Diaspora : un enjeu politique, un symbole, un concept ?. In: Espace populations sociétés [Online], 2006, No. 1, consulted on 24 November 2014. URL: http://eps.revues.org/960. KAPCHAN, D., 1994. Moroccan Female Performers Defining the Social Body. In: The Journal of American Folklore, vol. 107, No. 423, winter 1994, pp. 82‑105. KAPCHAN, D., 2007. Dar Gnawa: Creating Heritage and the African Diaspora through Sound, Image and Word. In: Congrès des Musiques dans le monde de l’islam, Conference. Assilah. 8‑13 August 2007. KAPCHAN, D., 2008. The Festive Sacred and the Fetish of Trance: Performing the Sacred at the Essaouira Gnawa Festival of World Music. In: Gradhiva: revue d’anthropologie et de muséologie, 2008, No. 7 (1), pp. 52‑67. KAPCHAN, D., 2011. Possessed by Heritage: A Sub-Saharian Tradition on Display in Tangier. In: SKOUNTI, A. and TEBBAA, O. (dir. ), De l’immatérialité du patrimoine culturel. Rabat: UNESCO. LORIAUX, F., 2004. L’Immigration marocaine en Belgique. Brussels. Centre d’animation et de recherche en histoire ouvrière et populaire. MAJDOULI, Z., 2007. Trajectoires des musiciens gnawa: approche ethnographique des cérémonies domestiques et des festivals de musiques du monde. Paris: L’Harmattan. PÂQUES, V., 1999. Couleurs et génies au Maghreb. In: CHLYEH, A. (dir. ), L’Univers des Gnaoua. Casablanca: La Pensée sauvage, pp. 52‑63. POUCHELON, J., 2012. Entre deux mondes. Redéfinitions contemporaines du statut de Gnawi. In: Cahiers d’ethnomusicologie, 2012, No. 25, pp. 9‑23. POUCHELON, J., 2014. Gnawa de Paris et de Montréal, une relève reterritorialisée ? In: La Transnationalisation du religieux par la musique. International conference. Montreal, 16‑18 October 2014. POUCHELON, J., 2015. Les Gnawa du Maroc: intercesseurs de la différence ? : étude ethnomusicologique, ethnopoétique et ethnochoréologique. Doctoral thesis in ethnomusicology. Nanterre. Université Paris Ouest. RAMNARINE, T. K., 2007. Musical Performance in the Diaspora: Introduction. In: Ethnomusicology Forum, 2007, v. 16, No. 1, pp. 1‑17. STOKES, M., 2012. Globalization and the Politics of World Music. In: CLAYTON, M., HERBERT, T. and MIDDELTON, R., The Cultural Study of Music, New York: Taylor & Francis, pp. 107‑116. SUM, M., 2012. Music of the Gnawa of Morocco: Evolving Spaces and Times. Doctoral thesis in music. Vancouver. University of British Columbia. 1 Source: Jan Hertogen, NP Data, 2011 et Le Soir, 15 February 2014; MCRME Maroc, cited in the exhibit Nass Belgica, Botanique (Brussels), February – April 2014. 2 The transcription method chosen for the terms in Moroccan dialect is intended to be simple, and does not show the variations of a word. The agreement between nouns and adjectives, in view of the many irregular plurals in Arabic, is the same regardless of the number: thus, Gnawa is used as a masculine and feminine word as well as for singular and plural forms. 3 Due to their similar origins and ritual practices, the Gnawa are very close to other northern African groups from a spiritual point of view: Stambouli (Tunisia), Sambani (Libya), Bilali (Algeria), Zar (Sudan) and Bori (Hausa from Nigeria and Niger) [El-Hamel, 2008]. 4 With the exception of a Jewish community in Fes [personal communication with the musicians Karim [alias] and Hicham Bilali, July 2014]. 5 After France (32.27% of the Moroccan diaspora lives there), Spain (20.06%) and Italy (12.01%) [Alaoui, 2013]. 6 The term “diaspora” is used here in the sense given to it by Wang Gung-Wu, who “places emphasis on the multiplicity of ties between communities formed by the dispersion of a population rather than on the exile from a place of origin and the ties with this place” [Berry, 2006]. 7 One example of the notation of the order of pieces in a lila by a maalem has been mentioned [Kapchan, 2007]. 9 Video excerpt: http://www.youtube.com/watch?v=R8dbunyaexk The group Karkaba, which emerged from the weekly rehearsals organised by Gnawa de Bruxelles and the association Met-X, accompanies the brass band Remork. This piece is a composition by Luc Mishalle, the creator of Met-X, based on the Gnawa rhythms played on the tbel (drum) and the qraqeb (castanets). 10 Mohamed-Saïd Aksari, current president of the ASBL Arts et folklore gnawa, personal communication, 24 April 2014. 13 Source: different interviews and musical analyses carried out with the musicians Rida Stitou, Imane Guemssy and Karim between April and July 2014. 14 Video excerpt: http://www.youtube.com/watch?v=8iAkNPYDkoU (Start watching the video at 0’43). The group Gnawa al Manar, recently renamed Black Koyo and led by Hicham Bilali (on the guembri), in this case calls to mind the traditional lila, with the musicians seated in a line along the wall. In this excerpt, they play different pieces from the sacred repertoire. Despite the visible presence of an amplifier during the filming of the video, the sound of the guembri is hard to detect, as it was during the traditionally acoustic performances. However, now the guembri are amplified during each public performance, both secular and sacred. 22 According to the season, the musicians mainly play at weddings and parties, from two times per month to several times per week. Hélène Sechehaye has a master’s degree in musicology from Université Libre de Bruxelles, and is beginning a doctoral thesis on the Gnawa in Brussels in co-supervision between Université Libre de Bruxelles and Université Jean Monnet de Saint-Etienne (France). She is currently working for Muziekpublique, an association which promotes traditional world music in Brussels. Stéphanie Weisser is a lecturer in ethnomusicology at Université Libre de Bruxelles and was a researcher and curator at the Musée des Instruments de Musique de Bruxelles. Her research focuses on African musical repertoires (the Amhara in Ethiopia and the Gusii in Kenya) as well as Indian repertoires. She has published many scholarly articles and two CDs at the Archives Internationales de Musique Populaire (Musée Ethnographique, Geneva), the most recent of which received the “Coup de Cœur Musiques du Monde” in 2014 from Académie Charles Cros (France).